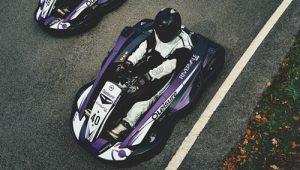 At Brighton Karting we have a choice of 3 different Karts, 270cc, 200cc and 120cc. This means we can cater for drivers as young as 8yrs old and look after a wide range of driving abilities. Our signature kart is the 270cc Sodi RT8 capable of speeds up to 65mph. Ultra modern and quite exceptional like none other we have tested. 1.The Sodi RT8 features the latest technology stemming from 30 years of unrivaled experience on the part of Sodikart’s Research and Development department. 2. Next up we have the 200cc Biz Evo Kart capable of speeds up to 45mph. This is the perfect entry level kart that can be found at most indoor Karting tracks but to give it a real test you need to take it outside. The kart gives a fantastic performance at a decent speed making this your perfect companion for Arrive & Drive sessions. 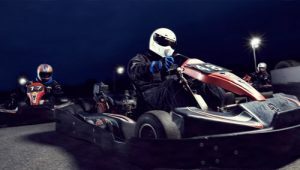 Fitted with a heavy duty plastic wrap around bumper system, this makes each kart as safe as possible and eliminates the chance of a kart to flip. Side pods are in place to absorb impact from contact with safety barriers or karts. 3. And last but not least we have our 120cc Biz Cadet Karts capable of speeds up to 39mph. 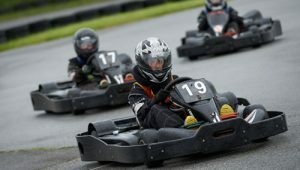 These karts are for kids aged 8 – 12 years old wanting to race in a fun, fast and safe machine. Available in Arrive and Drive and also used for our Brighton Karting Kids Championship.